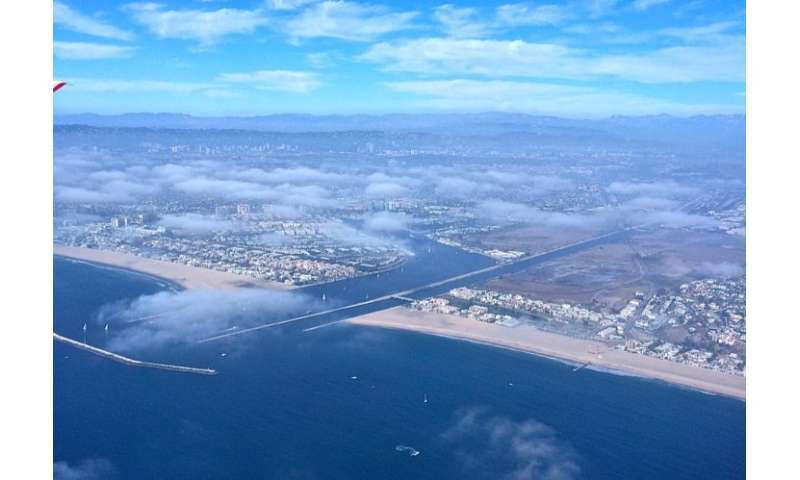 "Cloud cover is plummeting in southern coastal California," said Park Williams, a bioclimatologist at Columbia University's Lamont-Doherty Earth Observatory and lead author of the research. "And as clouds decrease, that increases the chance of bigger and more intense fires." Williams said the decrease is driven mainly by urban sprawl, which increases near-surface temperatures, but that overall warming climate is contributing, too. Increasing heat drives away clouds, which admits more sunlight, which heats the ground further, leading to dryer vegetation, and higher fire risk, said Williams. The study appears this week in the journal Geophysical Research Letters. Normally, stratus clouds form over coastal southern California during early morning within a thin layer of cool, moist ocean air sandwiched between the land and higher air masses that are too dry for cloud formation. The stratus zone's altitude varies with weather, but sits at roughly 1,000 to 3,000 feet. But heat causes clouds to dissipate, and decades of intense urban growth plus global warming have been gnawing away at the stratus layer's base, causing the layer to thin and clouds to burn off earlier in the day or disappear altogether. Cloud bases have risen 150 to 300 feet since the 1970s, says the study. "Clouds that used to burn off by noon or 1 o'clock are now gone by 10 or 11, if they form at all," said Williams. Williams and others have demonstrated a strong link between warming climate and increased wildfire in the western United States. But in southern California the link is more subtle, and clouds are a rarely studied part of the system. While few scientists have looked in detail at clouds, many California airports large and small have been collecting hourly cloud observations since the 1970s, not for research, but rather for navigational safety. Williams and his colleagues decided to tap this trove to develop a fine-grained picture of changing cloud cover over the region. They then compared it to a separate large database kept by the U.S. Wildland Fire Assessment System, whose researchers have regularly measured vegetation moisture in the hills outside Los Angeles for decades. By comparing the two sets of data, the team found that periods of less cloud cover during the summer correlated neatly with lower vegetation moisture, and thus more danger of fire. However, the study did not find that total area burned in summer has increased as a result of decreases in cloud shading. There are too many other factors at play, said Williams. These include yearly variations in rainfall, winds, locations where fires start, and perhaps most of all, decreases in burnable area as urban areas have expanded, and the increased effectiveness of fire-fighting. "Even though the danger has increased, people in these areas are very good at putting out fires, so the area burned hasn't gone up," he said. "But the dice are now loaded, and in areas where clouds have decreased, the fires should be getting more intense and harder to contain. At some point, we'll see if people can continue to keep up." The catastrophic California-wide fires that consumed over 550,000 acres in fall of 2017 were probably not strongly affected by the reductions in summer cloud cover, said Williams. Although he did find that vegetation is drier in fall seasons that follow summers with few clouds, the fall 2017 fires were driven mainly by extreme winds and a late onset of the fall rainy season. And ironically, part of this record wildfire wave resulted not from a recent record four-year drought driven in part by climate change, but rather from record rains that followed the drought, which produced a surfeit of flammable vegetation. Things will vary year to year, but Williams said he expects to see overall fire danger increase in California, as long as there is adequate vegetation to burn. The other authors of the study are Pierre Gentine of Columbia's Department of Earth and Environmental Engineering; Max Moritz and Dar Roberts of the University of California, Santa Barbara; and John Abatzoglou of the University of Idaho, Moscow.